For people who celebrate Hanukkah, the season is steeped in tradition and ritual. Learn the story of Hanukkah and the origins of its important customs in this Hanukkah worksheet that blends world history, geography and reading comprehension. Read the introduction and conclusion of this story starter, and use his own creativity to finish the story about Fiona's fury. How would the story of the Frog Prince go if it was told from the perspective of the other frogs in the pond? 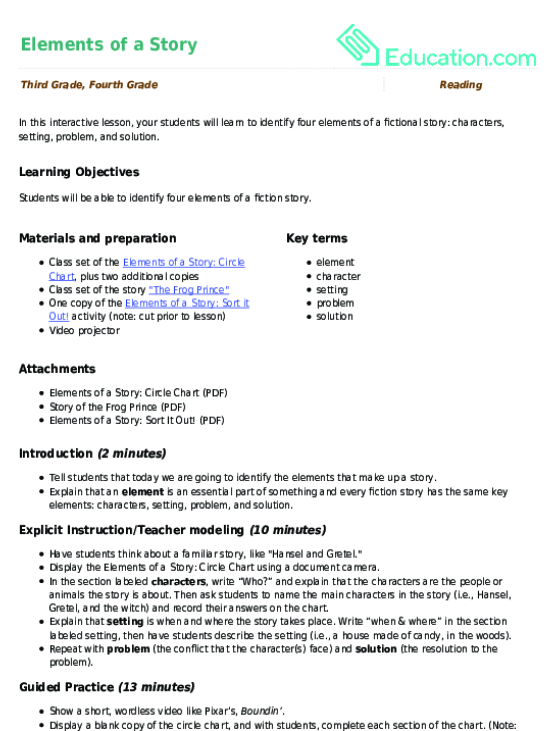 In this interactive lesson, your students will learn to identify four elements of a fictional story: characters, setting, problem, and solution. Your student must put her creative writing skills to the test to complete the parts of the story that are missing.